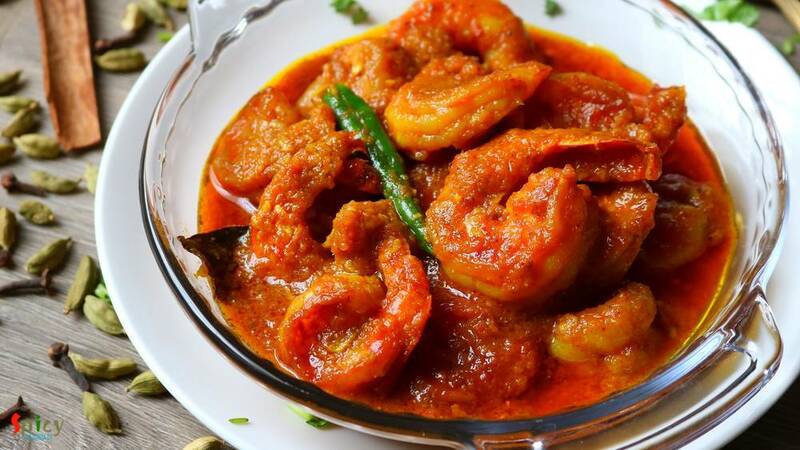 Chingri Macher Malai Curry is a traditional Bengali recipe rather delicacy, where Golda Chingri or Lobster is cooked in onion - tomato gravy and then addition of coconut milk makes the curry more rich and creamy, thus the name 'malai curry'. Though I made it with jumbo shrimps as we both are not fan of lobster. 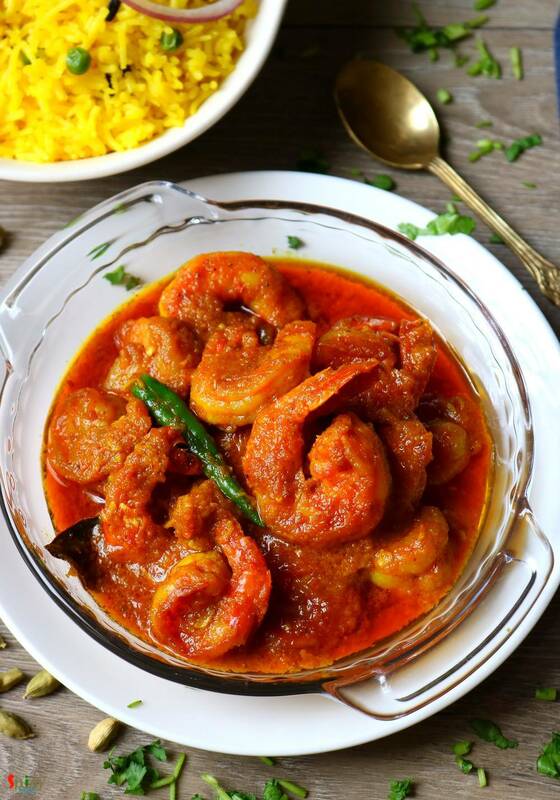 Taste of this Prawn malai curry came out delicious, neither too spicy nor too sweet, perfectly balanced. I served it with mishti pulao aka basonti pulao and the pair was heavenly. Do try this recipe and let me know how it turned out for you. 12-15 jumbo prawns or 2 lobster per person. Paste of a small onion. Puree of a small tomato. 5-6 Tablespoons of thick coconut milk. Spice powder (2 Teaspoons of turmeric powder, 1 Teaspoon of red chili powder, 1 Teaspoon of kashmiri chili powder). Whole spices (2 bay leaves, 2 green cardamom, 1 small cinnamon stick, 2 cloves). 1/4th cup of mustard oil. 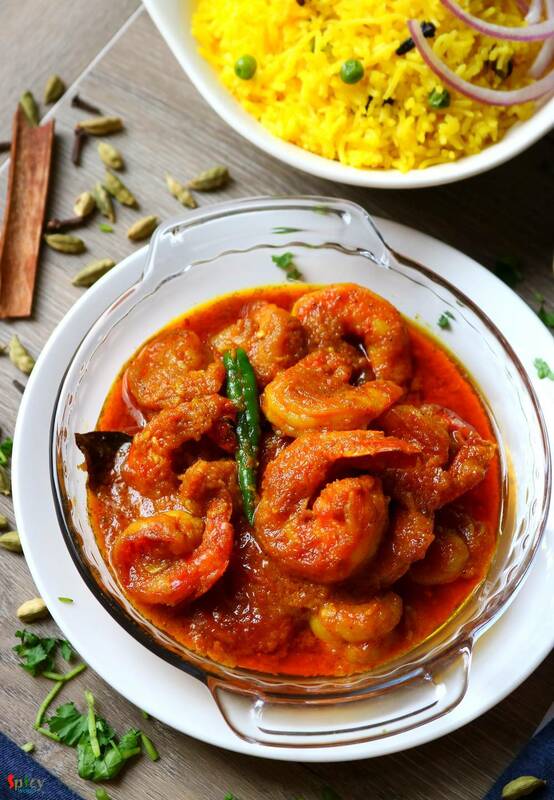 Ad some salt and 1 Teaspoon of turmeric powder to the deveined prawns. Mix well and keep aside for 15 minutes. Add the marinated prawns, cook on medium high heat for 3 minutes, not more then that otherwise they will become chewy. In that same oil add all of the whole spices. Saute for few seconds. Add onion paste, cook for 7-8 minutes on medium flame. Then add some salt and sugar along with all of the spice powder. Mix well for few minutes. Add yogurt, mix well and cook for another 3-5 minutes. Now add the fried prawns along with the drippings, mix well for 3-4 minutes. Then add coconut milk, mix well. Now add little hot water, cover the pan and cook for 5 minutes. Lastly add green chili, ghee and garam masala powder. Mix well and turn off the heat. Let it rest for 10-15 minutes hen serve. 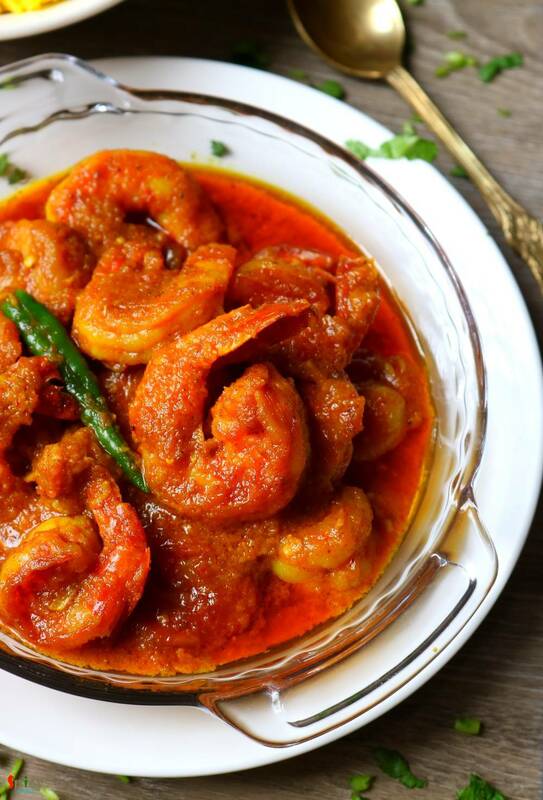 Your Chingri Macher Malai Curry is ready to serve.